If you are thinking of moving either part- or full-time to Mexico, you will need to live there for longer than a vacation stay. As much as realtors would have you believe renting in Mexico is just like at home, it's not (for one thing, the industry is not nearly as regulated). 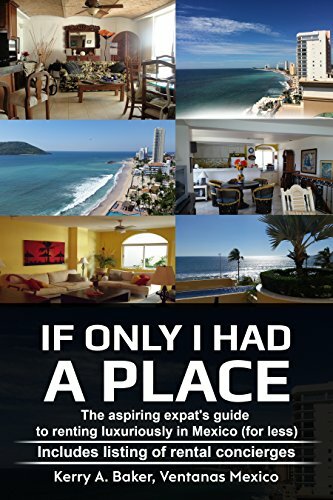 This 156-page book takes you through the steps of how to secure a luxurious longer-term rental in Mexico for less than you ever imagined, year after year, and explains why where you live will be so important to your happiness as an expat. "Where you live and your experience while renting the first few years will form the basis of what you believe about Mexico and Mexicans. This isn’t a book about just “finding a place.” It’s about developing a system that will serve you year after year, for either the first few years while deciding upon permanent residency or one you can employ in order to live in Mexico part-time, indefinitely." Are you worried about renting a place online, only to find that it’s not as represented, or worse, non-existent? It does happen. This book also provides a listing of reputable local rental concierges who can preview a property, house or apartment for you before you sign. All know their areas well. Most have an online presence such as their own blogs and business websites. They have been recruited and screened to give you precious peace of mind as you are deciding where you want to live as you test drive living in Mexico. Have you already purchased the book? Register to receive updates on rental concierge listings and new information on renting as it's uncovered. Make sure to write "Book Purchase" in your notes when you register and you will be sent only updates related to renting and concierge listings. Don't forget! You don't need an e-reader to buy this book as a e-b00k. Simply download the Kindle app to read on your computer or laptop. Here is a sublet site which might be a place to get started, as long as you read my book first! [Five Stars] - This book is incredibly insightful and full of the type of information that you don't even know you need when considering living in Mexico. - Jennifer F.
About the author: Kerry Baker also the author of “The Interactive Guide for Learning Spanish Free Online,” a curation of the best free Spanish learning tools on the web and the principal blogger for Ventanas Mexico. The book is completely interactive, linking you to features and tools via direct links. Use is with your laptop, tablet or e-reader. Both books are based on both personal experience (that you'll find in Ventanas Mexico blogs) and extensive research.